Published in the South Kent Gazette, 9 January, 1980. The Connaught Hall and adjoining rooms, including the Mayor’s Parlour, were built from the designs of Mr W. Burgess, and opened by the Duke and Duchess of Connaught in July, 1883, the building having cost £19,000. It contains two windows in memory of the wife and children of Mr W. R, Mummery, one in memory of Mr C. K. Freshfield, M.P., 1865-85; another in memory of Major A. G. Dickson, M.P., 1865-89, one erected in 1906 in memory of Mr Edward Worsfold Mowll, Register of the Dover Harbour; and also a grand organ, the gift, at a cost of £3,000, in 1902, of the late Dr Astley. Later additions to the Municipal buildings centred round the old Maison Dieu were public baths, since closed, and the purchase of the Maison Dieu House, in 1904, for offices. Brook House, in the one-time Maison Dieu fields, was acquired in 1920, and taken into use as Municipal offices in connection with a new arrangement, by which the town clerk ceased to provide offices and staff. The grounds of Brook House were made into public tennis courts and gardens with access from Maison Dieu Road to Biggin Street. But in recent years these were destroyed to provide parking for council staff. In 1923, a dental clinic, the gift of Major the Hon. J. J. Astor, M.P., was erected in a corner of Brook House gardens. It was subscribed for by the people of Dover, and was unveiled on November 5th, 1924, by Vice-Admiral Sir Roger Keyes, who commanded the Dover Patrol during the war. After the unveiling of, the war memorial, the Dover Patrol Golden Book of Remembrance, a beautifully illuminated book containing a list of those who fell in the Dover Patrol, was handed by Sir Roger Keyes to the mayor, to be preserved in a case in the town hall. A duplicate Book of Remembrance is kept in St Margaret’s Church, near which, on Leathercote Point, stands the Dover Patrol Memorial, a granite obelisk, 83ft in height, unveiled by the Prince of Wales on July 27th, 1921. Similar monuments have been erected on Cape Blanc Nez and at New York. A Technical Institute and School of Art was built at the rear of the town hall in 1894 by the town council, at a cost of £12,000. The architect was Mr J. S. Chappie, and the builder Mr William Bromley, the foundation stone being laid by Lady Crundall. The Education Act, 1902, however, transferred the control of such education to the Kent Education Committee and in later years the “Institute“ became part of the South East Kent Technical College. The Dover School of Art and Science dates from 1870. At the end of 1968 the then mayor, Alderman Birmingham, called a Common Hall, which decided to take steps to form such a school. Sir Wollaston Knocker and the Lord Warden, Earl Granville, strongly supported the movement, but it was some years before it became very successful. Rooms were found for it in the summer of 1870 at the premises later named Admiralty House, but at the time called Cambridge House, in Strond Street. The opening took place on August 8th, 1870. The school only remained there a short time, as the premises were taken at the end of that year for the offices of the Mail Superintendent of the L.C. and D.R., Captain Morgan.' Temporary accommodation was then found at Licence’s Marine Library, near the sea end of Woolcomber Street. In 1873 another move was made, to premises in East-brook Place, between Castle Street and Wyham House, then called Brook Lodge. In 1877, better accommodation was found over the Northampton Street Drill Hall and Earl Granville opened the school there on November 3rd, and for the next twenty years that was Dover’s Art School. Some forty years later this Northampton Street building, on being abandoned as a Territorial Drill Hall, was again put to educational use, being transformed into a technical school by the county authorities. Today the technical college is largely housed in a purpose-built structure adjoining the River Dour and sandwiched between Biggin Street and Maison Dieu Road, with access from The Paddock. This section traverses the site of the ancient eastern harbour and its surroundings, including Dolphin Lane (upper), St James’s Street, Townwall Street, Woolcomber Street and Trevanion Street. Townwall Street owes its name to the fact that it was originally the thoroughfare which followed most closely the line of part of the old town wall. Here and there the town wall abutted on various other streets, but Townwall Street, from its commencement at the top of Snargate Street to where it originally ended at Woolcomber Street, was alongside Withred’s Wall for its whole length. No surviving buildings in this street are particularly old. When the wall existed, the land inside it was a waste, where the Town Guard might patrol, and where the Trained Bands might muster for purposes of defence. The present thoroughfare is, at the lower part, on the inside of the site of the wall, and at the upper part where Clarence Street stood, in the outside of it. As evidence that the land inside the wall was used for purposes of defence, it may be mentioned that when Mr Alexander Bottle’s chemist shop was being built, in 1838, two pieces of ordnance, called culverins, probably of the time of Henry VIII, were discovered there, buried in the ruins of the wall, and Lieut. Benjamin Worthington, RN, had them cleaned and mounted, and presented to the Museum of the Naval and Military Institution, 'London. An attractive lithograph of the Maison Dieu published by W. Bateheller, at New Bridge, Dover, in 1833. 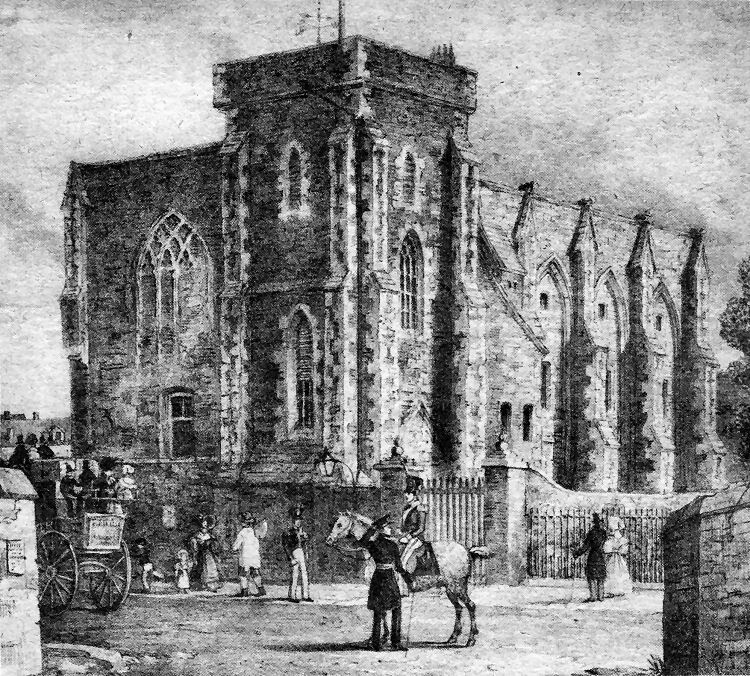 The print depicts the Town Hall as it appeared from Effingham Crescent. With an obvious military flavour, the picture was dedicated by the publisher to Colonel Arnold, KCB, Commander of Dover Garrison. The year after publication the Maison Dieu was purchased by the Dover Corporation from the Board of Ordnance who acquired it from the Naval authorities. To finance the deal the Corporation took the extraordinary step of mortgaging the town’s valuable silver plate and the old Guildhall in the Market Square! Note the wall separating the Maison Dieu from the adjoining Maison Dieu House—now the public library—which, until the mid-1850s was the home of Dover brewer Mr William Kingsford.